NDO - Indonesian President Joko Widodo and his spouse began a State visit to Vietnam from September 11-12 at the invitation of Vietnamese President Tran Dai Quang. The visit, made on the occasion of the Indonesian President’s attendance at the World Economic Forum on ASEAN, is a significant political event for bilateral ties, reaffirming the appreciation and hope for further tightening the Vietnam – Indonesia strategic partnership and traditional friendship. Indonesia is the world's largest island country, with a chain of more than 17,500 islands between Asia and Australia, spreading from the Indian to the Pacific ocean. It has a population of more than 260 million from over 300 ethnic groups, with 86.1% of them being Muslim. The country’s GDP was an estimated US$1.011 trillion in 2017. 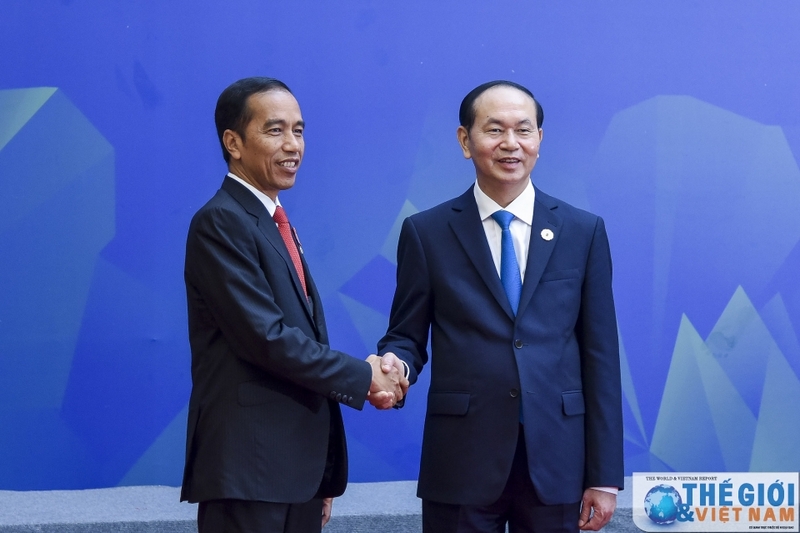 Since Vietnam and Indonesia established diplomatic relations in 1955, the bilateral traditional friendship and multifaceted cooperation have been nurtured and developed by generations of leaders and peoples of the two countries. In June 1989, the two sides officially launched the Vietnam – Indonesia air route. Many Indonesian firms have come to Vietnam to explore investment opportunities. Bilateral relations entered a new stage with the historic visit of President Suharto in November 1990. Bilateral relations have been lifted to a new height since the two sides issued a joint statement, officially established the bilateral strategic partnership, during the state-level visit to Indonesia by Vietnamese President Truong Tan Sang in June 2013. In August last year, Party General Secretary Nguyen Phu Trong paid an official visit to Indonesia, setting a new milestone in the history of the bilateral relations. We are glad to see that Vietnam – Indonesia cooperation has developed robustly across the fields of politics, economics, culture, education, defence and security. The political relationship between the two countries has become more and more intimate and trustworthy, as evidenced by frequent high-ranking delegation exchanges. Cooperation mechanisms, such as the Bilateral Cooperation Committee at the foreign ministerial level, deputy ministerial-level Security Dialogue, have been effectively maintained. In recent years, trade between the two countries has seen encouraging progress. The value of two-way trade reached US$ 6.5 billion in 2017. As of June 2018, Indonesia ranked fifth largest among ASEAN nations and 30th among the 126 countries and territories worldwide investing in Vietnam, with 71 projects, mostly in oil and gas exploration and exploitation, coal mining, banking, hotel industry, and wood processing. The bilateral security – defence relations have continued to grow while bilateral cooperation in education, culture and sports have been fostered. Every year, Indonesia has provided Vietnam with short, middle and long term scholarships in such areas as education, culture and linguistics. Cooperation in tourism, people-to-people exchange, and cooperation among localities of the two countries has also been tightened. Vietnam and Indonesia have supported each other in regional and international issues and have cooperated productively at multilateral forums. The State visit to Vietnam by President Widodo and his spouse reaffirm the determination of leaders and peoples of the two countries to further strengthen the Vietnam – Indonesia strategic partnership and traditional friendship, and to reinforce reliable political relations between the two sides. The visit also provides an opportunity for the two sides to discuss orientations for bilateral cooperation in the new stage, five years after the establishment of the strategic partnership, as well as regional and international issues of mutual concern, contributing to peace, stability, cooperation and development in the region and the world at large.